Adapt-ABILITY is a comprehensive Healthcare resource for the disability and elderly and our showroom provides a huge variety of disability aids. The business operates a home delivery service to most parts of Northumbria, Durham and Cleveland. 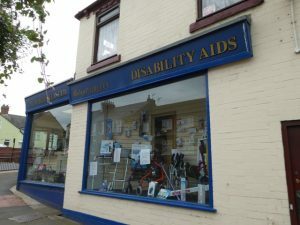 Adapt-ability is part of a group of locally based companies which can provide nearly everything for healthy living, from aids for the disabled and elderly to the dispensing of private and NHS prescriptions and the testing of eyes and dispensing of spectacles. We are proud to have been providing healthcare to the people of the Northeast of England for over 75 years. The group employs over 12 Pharmacists, two Optometrists, qualified Service Engineers and around 100 other staff from Dispensing Technicians to Medicine Counter Assistants and Delivery Drivers, all involved in improving the health and quality of life in our region. Adapt-ABILITY’s Consumer Credit Licence allows them to hire out equipment and provide Interest Free Credit subject to status, 0% APR typical (Written details on request). Saturday: 9.00am – 12.00pm . For further information visit the Adapt-ABILITY website.